Do denim shorts scare you just a tiny bit? 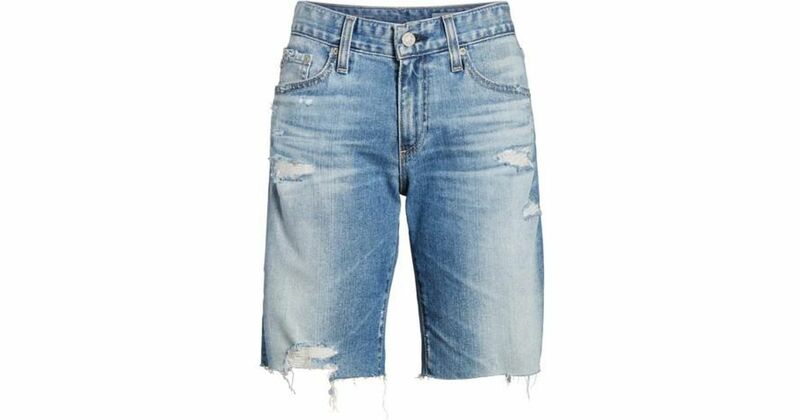 Up until this spring, I was underwhelmed by the choices for a great pair of denim shorts. I love a great pair of shorts but I just have never loved the super tight version, and moved away long ago from Daisy Duke land. If you love them, you go girl. But for me, in the hotter days of summer, I do not go anywhere near the denim pile in the closet and tight denim is not on the list of summer favorites. And then, I found the Holy Grail of chic jean shorts, and not that is not an oxymoron. 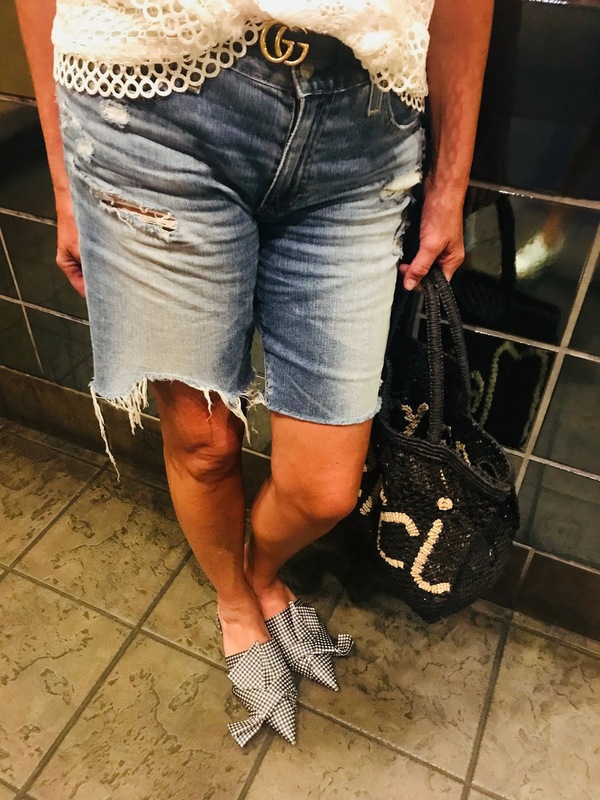 "Jorts" as they are called by some (not me) are a longer version of the denim short, making them a perfect alternative to wearing a jean skirt. Fit is everything and so is styling. Here is my take on styling denim shorts to look and feel cool during the summer heat! The AG Nikki Cutoff Denim Short, which I found at Nordstrom Downtown, is my pick for favorite denim shorts. They are tight in the right places as well as loose too, but not baggy, even after a day or wear. 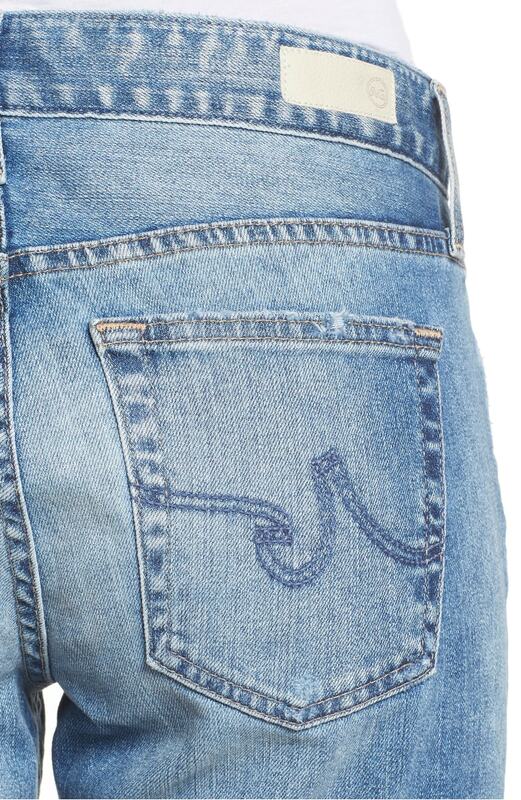 I love the distressed wash of the Japanese denim, and the frayed hems give them an edge. The longer leg hits above the knee. I like to think they have a bit of a Kate Moss at Glastonbury vibe. 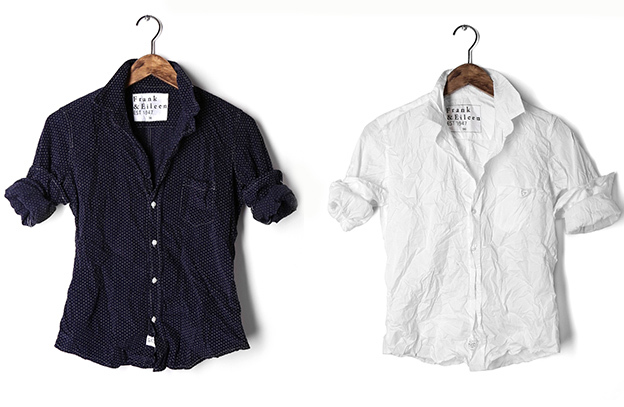 And how to wear them to elevate your look just ever so slightly? 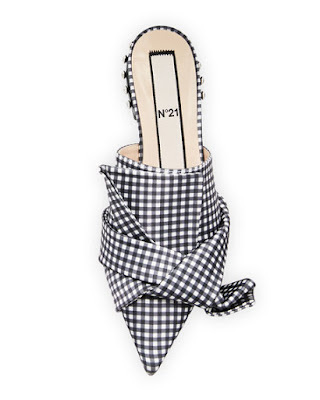 First, skip the flip flops, and go for a pair of fabulous flats. I wore my No. 21 Gingham Flat Slide Bow Mules, because a pointy toe is always a good idea. I added a super feminine lace top to contrast with the distressed denim. Mine is a favorite from last summer by Ted Baker in white, but I think a navy top would be equally gorgeous, like this Gabbby Mixed Lace Frill Sleeve Top. For a different look, if weather permits, add a cool blazer to your denim look. I wore my J.Crew Linen Blazer in a leopard print (sold out but here is another ) over a white Frank & Eileen classic white shirt and flat gladiator sandals to give the shorts a more sophisticated look. Of course sneakers and denim are a classic pairing, so go for a pair that have stand out style. 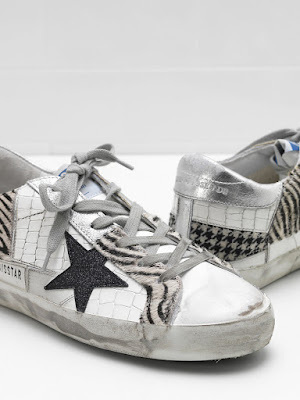 I love the Golden Goose Superstars, which, while pricey, are big on personality. If you wear the GG's, (which come distressed) with your equally distressed shorts then wear a black silk tank. Think opposites attract, and make you attractive. ;) Denim shorts are a timeless closet staple, meant to be a chameleon to your style.